The Thomas Jefferson Medical Reserve Corps (TJMRC) was established by the University of Virginia School of Medicine in 2003. As the first student-run MRC in the country, the UVAMRC is a model in student-faculty partnership and outreach. In late 2009, the MRC was expanded and its housing and management was moved to the Thomas Jefferson Health District. The UVA medical, public health and nursing student operations continue as a chapter of the organization. 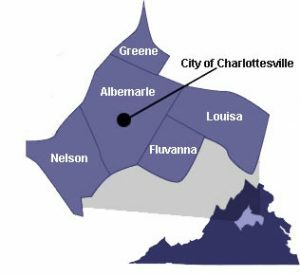 The TJMRC recruits, pre-trains and pre-credentials volunteers in Albemarle, Charlottesville, Fluvanna, Greene, Louisa and Nelson. We welcome volunteers of all backgrounds and skill sets who are interested in public health and in protecting their communities during public health emergencies. We partner closely with area voluntary agencies, volunteer programs, hospitals, local governments and emergency services to ensure that our volunteers complement, rather than replace, existing response efforts. Answering questions and gathering information from a public information phone line. Working with community healthcare providers to identify new cases. Clinical volunteers would assist in triaging at registration to ensure that community members go to the appropriate shelter site and be on-hand to provide basic first aid to shelter residents. Volunteers with training in environmental health would assist the Environmental Health Specialists to assess the shelter site for safety. TJMRC Veterinarians, Veterinary Technicians and TJMRC volunteers trained in pet shelter response would assist in checking all incoming animals for vaccinations; provide vaccinations for unvaccinated animals, if available; and register animals for sheltering. Pharmacists, Pharmacy Technicians, clinicians and TJMRC Volunteers would assist with aspects of mass dispensing of antivirals, antibiotics and other medications in response to a bioterrorist attack, pandemic flu or other event requiring mass dispensing. Nurses, Physicians and Nurse Practitioners would assist with mass vaccination. Volunteers trained in Points of Dispensing Sites would assist by helping community members to fill out forms; provide rumor control; explain the process of mass dispensing; and answer questions from the public.